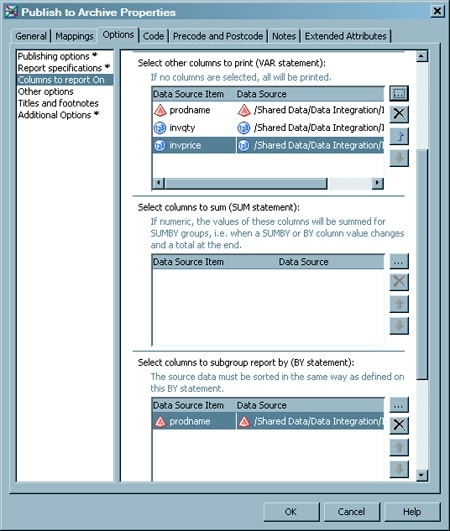 The Publish to Archive transformation uses the Publishing Framework feature of SAS Integration Technologies. This framework provides a complete and robust publishing environment for enterprise-wide information delivery. It consists of SAS CALL routines, application programming interfaces (APIs), and graphical user interfaces that enable both users and applications to publish SAS files (including data sets, catalogs, and database views), other digital content, and system-generated events to a variety of destinations such as email addresses, message queues, publication channels and subscribers, WebDAV-compliant servers, and archive locations. The Publishing Framework also provides tools that enable both users and applications to receive and process published information. For example, users can receive packages with content, such as charts and graphs, that is ready for viewing. SAS programs can receive packages with SAS data sets that might in turn trigger additional analyses on that data. You want to create and print an HTML report. Then, you want to save an archived version of the data. Select and drag a Publish to Archive transformation from the Publish folder in the Transformations tree. Then, drop it in the empty job on the Diagram tab in the Job Editor window. Right-click the Publish to Archive transformation and select Ports Add Input Port. 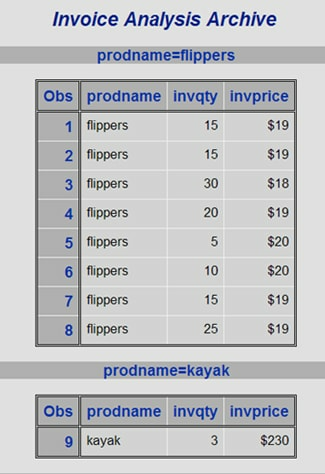 Select and drag the source table from the Inventory tree. Then, drop it before the Publish to Archive transformation on the Diagram tab. Drag the cursor from the source table to the input port of the Publish to Archive transformation. This action connects the source to the transformation. Ensure that the output of the job can be sent to the Output tab of the Job Editor window. (If the Output tab is not displayed, enable it with the Show Output tab check box on the General tab of the Options item in the Tools menu.) 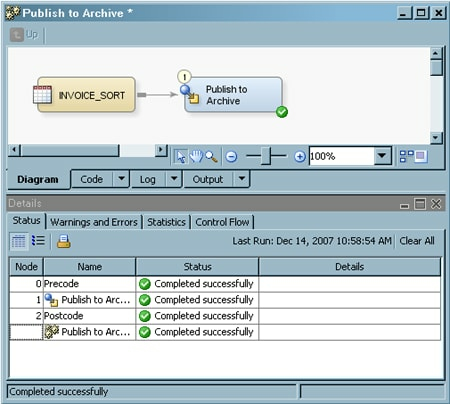 The following display shows a sample process flow diagram for a job that contains the Publish to Archive transformation. 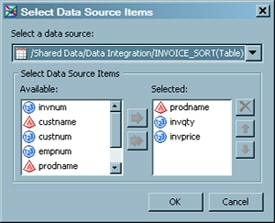 Note that the source table for the sample job is named INVOICE_SORTED. Open the properties window for the Publish to Archive transformation on the Diagram tab in the Job Editor window. Then, click the Options tab. Click Columns to report on to access the Columns to report on columns page. Use the column selection prompts to access the columns that you need in the SAS tables included in your job. For example, you can click for the Select other columns to print (VAR statement) to access the Select Data Source Items window, as shown in the following display. 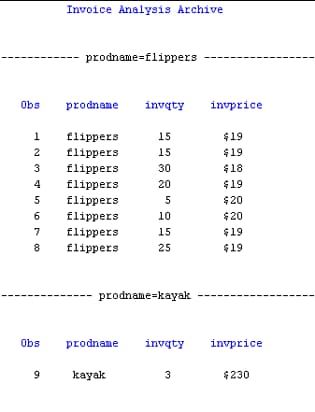 In the sample job, the VAR statement columns are prodname, invqty, and invprice. The column assignment options for the sample job are shown in the following display. Set the publication options for the report on the Publishing options page. The options for the sample job are shown in the following display. Note that the options to set a path for the archive file and specify the archive filename are required. Set the remaining options for your report in the appropriate fields. For example, the path and filename for the report generated by the sample job are specified in the Specify path and filename for generated report field on the Report specifications page. (Make sure that you click Generate PROC PRINT from input table in the Generate PROC PRINT or send existing report field). A title for the sample job report is set on the Titles and Footnotes page. To view the generated reports, click the Output tab in the Job Editor window. The following display shows the report for the sample job. You can find the archive file (invarchive.spk) in the directory that you specified. 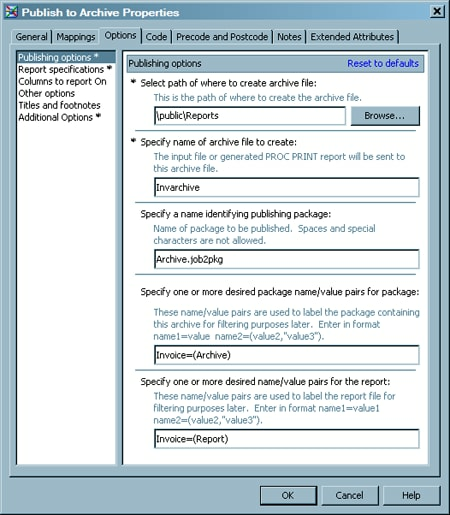 You can access the archive file with the SAS Package Retriever. The archive file is a compressed file that has to be unzipped for the report to be viewed. Navigate to the HTML file using the path that you configured on the Report specifications page on the Options tab. Sample HTML output is shown in the following display.